↑ Less than eight were completed prior to 1 अप्रैल 2008. ↑ "Adjustments Put F-35 on Track, Program Director Says". US DoD, 23 फ़रवरी 2011. 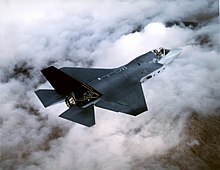 ↑ Cost Predictions Rattle Foreign Customers&next=0 "JSF Cost Predictions Rattle Foreign Customers." Aviation Week, 23 मार्च 2011. ↑ Shalal-Esa, Andrea. "US Navy, Air Force may field F-35s later than 2016." Thomson Reuters, 21 अप्रैल 2011. ↑ King, Samuel Jr. "First F-35 arrives at Eglin." U.S. Air Force, 15 जुलाई 2011. Retrieved 20 जुलाई 2011. ↑ "Lockheed Martin F-35 Lightning II". Jane's All the World's Aircraft. (online version, 21 जनवरी 2008). ↑ अ आ "FY 2012 Budget Estimates", p. 01–1. U.S. Air Force, February 2011. ↑ अ आ इ , Schwellenbach, Nick. "JSF Likely Far More Expensive Than Aircraft They're Replacing." Project on Government Oversight, 15 फ़रवरी 2011. ↑ Fulghum, David A. "Canada Expects Much Higher JSF Unit Costs." Aviation Week, 10 मार्च 2011. ↑ Dudley, Richard. "Program Partners Confirm Support for F-35 Joint Strike Fighter." Defence Update, 5 मार्च 2012. Retrieved 18 मार्च 2012. ↑ "Israel plans for second F-35 squadron." United Press International, 27 फ़रवरी 2012. Retrieved 18 मार्च 2012. ↑ "US Lockheed Martin F-35 chosen as Japan fighter jet." BBC News, 20 दिसम्बर 2011. Retrieved 20 दिसम्बर 2011. ↑ Fukue, Natsuko. "U.S.-made F-35 is chosen for ASDF". Japan Times, 21 दिसम्बर 2011, p. 1. ↑ Wall, Robert, "Lockheed Dismisses Korea F-35 Schedule Issue." Aviation Week. 21 फ़रवरी 2012.